Garage door spring is one of the most important parts of your door and it work under a lot of pressure. That’s why, it is highly recommended to contact a garage door professional in Brampton to repair your torsion spring. Just like other major appliances, your overhead door and its parts need maintenance and repair service. Every overhead door has two springs. If one or both springs are broken, you will not be able to open the door anymore. The garage door is designed to last for decades. But if you fail to give attention to it, you may face wear and tear problem or bumping the garage door with the car. If you notice any wear and tear sign or some other clues that show it’s time for replacement, call a garage door professional and replace it as soon as possible. The problem opening and closing the door: When you open the door and suddenly it stops, broken spring could be the problem. In such situation, don’t force your door to open and shut. When you open and close the door, it counts as one cycle. Every spring is designed to last about ten thousand cycles. It means, your garage door spring will last around ten years. So, if you have more than ten years old spring, you need to think about to change it. Unusual noise: When a garage door spring breaks, it creates a loud and awkward noise due to the coil spinning on the shaft. When homeowners heard this loud noise, some of them are thinking that some try to break into their house. If you don’t have a safety cable middle of the extension spring, it can be very dangerous for you and your family members. A safety cable helps to keep the spring in its proper position when it breaks. Your section door is bent: Many homeowners have installed a section garage door. If you have broken spring and tries to open the door, it may bend the top part of your door. Sometimes, replacing the top part of the door could be costly. It is better to replace the broken spring first and then think about to change the door. Crooked or stubborn door: If your overhead door takes too long time to open and close, chances are high that you have a broken spring problem. If your door stops a lot while you open it or create any other problem, it is time to contact a garage door professional. Is your garage door creating problem when you open and close the door. 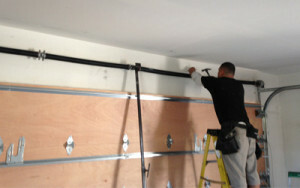 If so, you can contact to Brampton Garage Doors in Brampton. We will send an adept technician who will perform the right job and give you the answer of your questions and peace of mind that you deserve.